I overheard Maa and Jethima (Aunt) talking about Gota Sheddho last week when I was at my Kolkata resident! I was sipping my morning cup of coffee and enjoying their chitchat. A dish I have grown up eating with that too once in a year! Have you heard about this Bengali thick Veggie and Lentil Soup before! This is is a must have at my place and I have seen my mother and aunts cooking it every year on the night of Saraswati Puja. I left Kolkata in 2009 and shifted to Bihar and then again I shifted to Delhi after my marriage. I was not been there in Kolkata for Saraswati Pooja till date. To be very frank I have not tried my hands all these years with this particular delicacy. “You should spread love and share Gota Seddho”, Yes, that’s what I remember about this dull, brownish, Lentil Veggie Cold Soup, Gota Sheddho. So very simple and cooked with almost no spices however it tastes amazing at least to my taste bud! This dish is always special to me for the simplicity that it has. 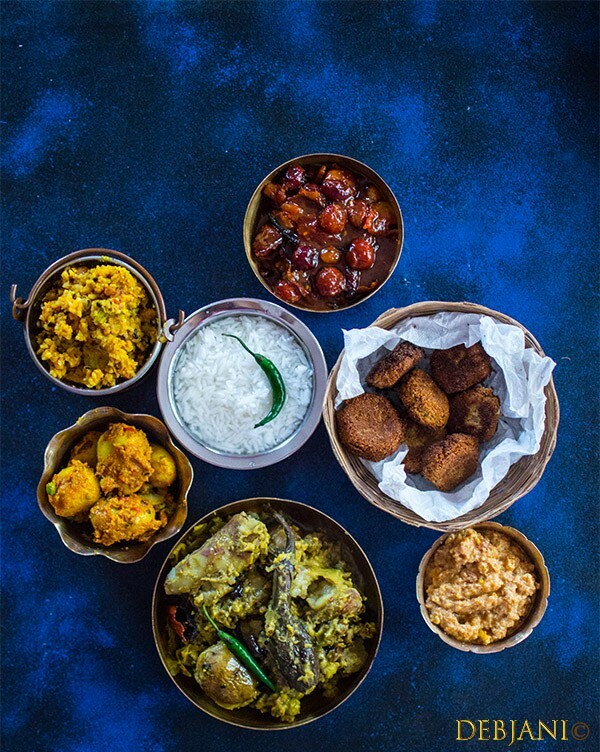 For me, it’s an exceptional Bengali dish with the use of almost “No Spices”. This, however, is not a typical character of Bengali Cuisine. Gota means “Whole” while Sheddho depicts for “Boiled”. 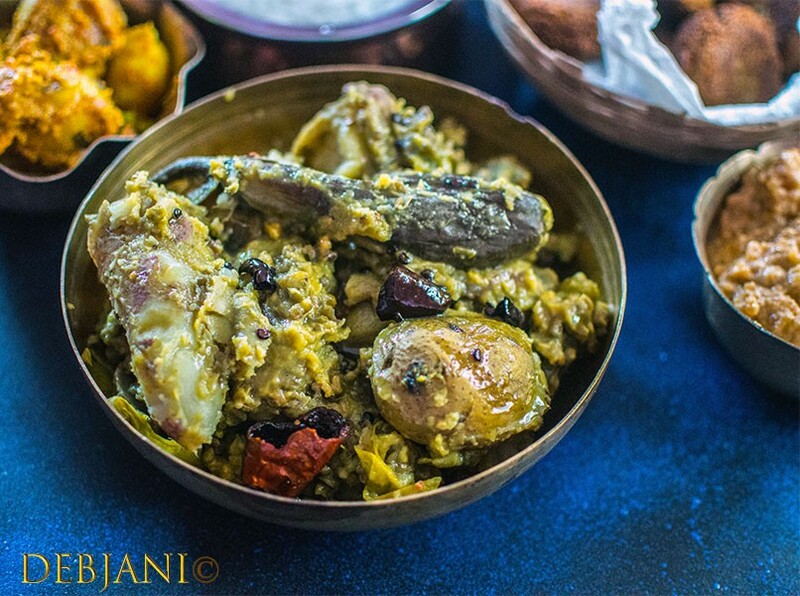 Traditionally this dish is prepared with Six types of Veggies (Potato, Sweet Potato, Baby Eggplant, Peas with the pod, Hyacinth Beans and Baby Spinach) and each of the veggies have to be used in a quantity of six along with Green Moong Dal. Some people use Black Urad Dal instead of the Green Moong Dal, however, the later is considered non-vegetarian by several families and hence they opted for the former one. 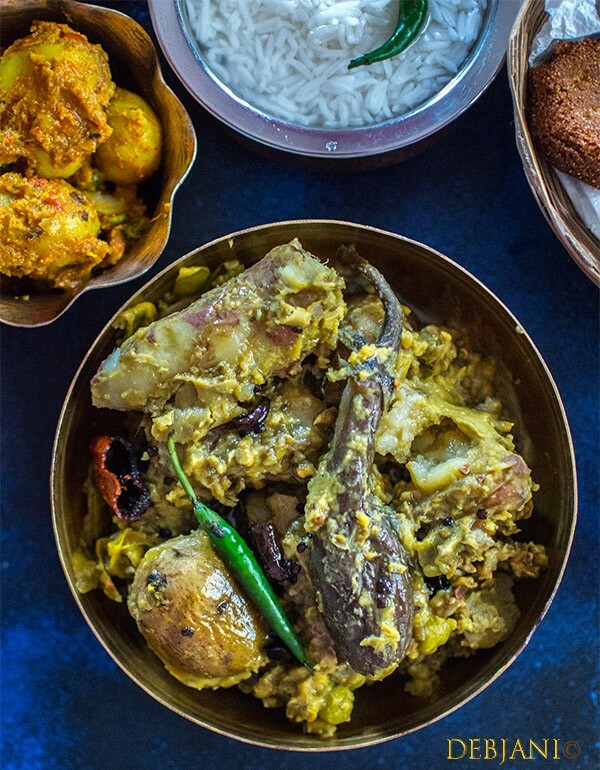 This is a Traditional Bengali thick Soup prepared in the winter or specifically on the night of Saraswati Puja or Basant Panchami and after giving whole night rest to the dish is served on the next day which is known as Shitol (cold) Shashthi (6th Day). Bengali Mothers worship Goddess of Fertility “Ma Shashthi” on the day of Shitol Shashthi to protect their offsprings from any harm that may arise! They don’t opt for anything hot on the day of Shitol Shoshti and that is the reason the cooking is done on the previous day along with some more Bengali delicacies. Conventionally Shitol Shashthi is the day of giving a break to the “Shil Nora” or the “Shil Batta” the traditional Indian Grinder and hence Shil Nora is also worshiped on the same day that is why Bongs eat food prepared last night on that day. Another tradition is to share the food; especially the bowl full of Gota Sheddho amongst the nearby family members, friends, and even neighbors. It is believed that Gota Sheddho is a Pox preventive food (especially Smallpox). I don’t know how far it is true. Even I am not sure what’s doctors say about this myth however, this is what aged Bengalis believe! To me, this is the epitome of Comfort Food. Here’s how I make Gota Sheddho at Debjanir Rannaghar! 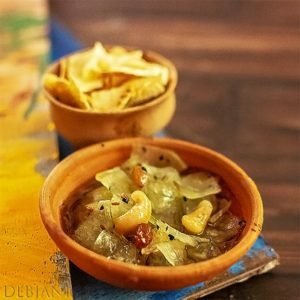 Gota Sheddho is a Traditional Bengali thick Lentil Soup prepared with lots of Veggies in the winter or specifically on the night of Saraswati Puja. Wash each of the veggies carefully. Don't peel the skin from the veggies or remove the pod of Peas or the stem of Eggplant. Some people prefer to soak the Daal before cooking. However, my mother does not soak it before cooking and I have followed her process. Take the Daal in a big vessel and pour sufficient water to cover it and cook for around 30 minutes or till the Daal soften ⅓d. Add Potatoes followed by the Sweet Potato, Hyacinth Beans, Peas, Baby Eggplant, Baby Spinach. Give a gap of 10 minutes in between the veggies. Cover the Vessel with a lid and cook on a medium flame for around 1-1.5 hour. You need to cook till the veggies and Daal soften but remain in shape. It took me about 1.20 hour for making the dish. You can also pressure cook it but I prefer the traditional way of preparing Gota Sheddho. whistles are enough for pressure cooking. Now it’s time to give the dish an overnight rest which I also did. Heat 1 Tbsp. of Mustard Oil in a Wok and temper the oil with Dry Red Chili and salt. Pour the Oil along with Red Chili, Green Chili and a dash of lemon juice over Gota Sheddho and serve it with Panta Bhat (rice). On the Next day serve Gota Sheddho as it. Sprinkle Salt and drizzle a drops Mustard oil as well. Add chopped Green chilies and a piece of Lemon to make it more flavorful. Serve it cold with plain rice (preferably prepared last night known as Panta Bhat). #Gota Sheddho pictures were updated in 2018.